Brad Skaar, Ames, Iowa, evaluated the 141 entries. 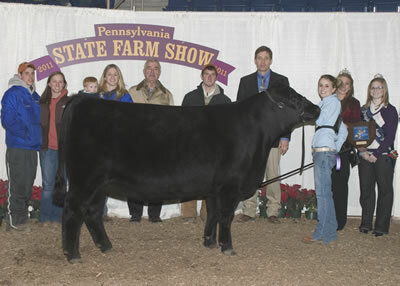 B C A Hallie H911 won grand champion female at the 2011 Pennsylvania Farm Show's Angus Show, Jan. 10 in Harrisburg, Pa. Hannah Grim, East Berlin, Pa., owns the April 2009 daughter of B/R 65R Genesis. She first won junior champion. 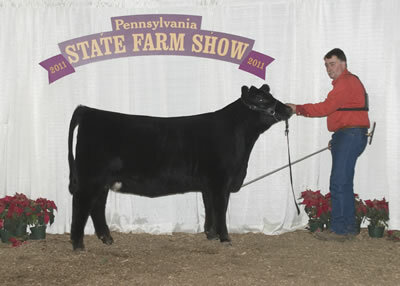 Rains Sunlight Halo Lo878 won reserve grand champion female at the 2011 Pennsylvania Farm Show's Angus Show, Jan. 10 in Harrisburg, Pa. Dale Rains, Mercer, Pa., owns the April 2009 daughter of B C Lookout 7024. She first claimed reserve junior champion. 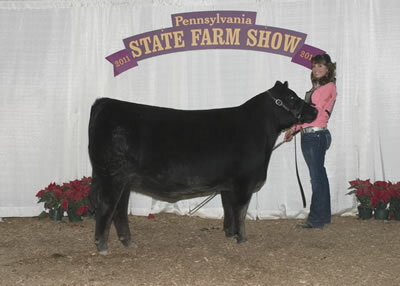 B C A Scaara Belle 933 won intermediate champion heifer at the 2011 Pennsylvania Farm Show's Angus Show, Jan. 10 in Harrisburg, Pa. Hannah Grim, East Berlin, Pa., owns the winning heifer. 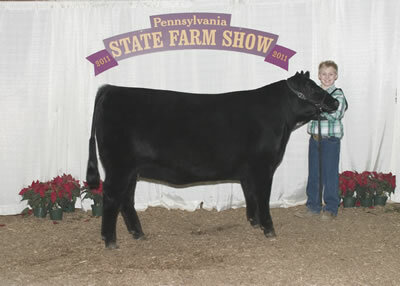 Cedar Hill Charlie Nadine159 won reserve intermediate champion heifer at the 2011 Pennsylvania Farm Show's Angus Show, Jan. 10 in Harrisburg, Pa. Dakota Mayle, Dover, Pa., owns the winning heifer. 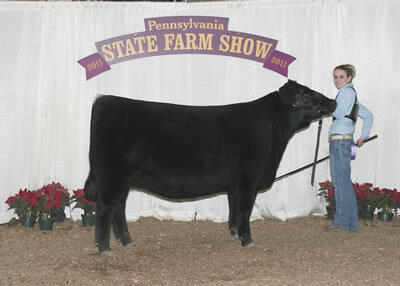 Cherry Knoll Cheyenne 9077 won senior heifer calf champion at the 2011 Pennsylvania Farm Show's Angus Show, Jan. 10 in Harrisburg, Pa. Katrina Frey, Quarryville, Pa., owns the winning heifer. 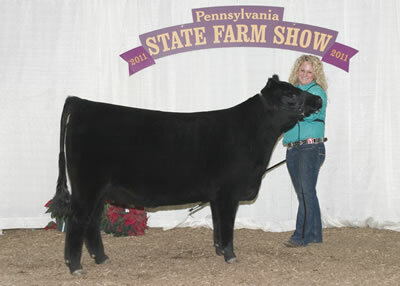 Cedar Hill Scaara 259 won reserve senior heifer calf champion at the 2011 Pennsylvania Farm Show's Angus Show, Jan. 10 in Harrisburg, Pa. Alysha Sweitzer, Wellsville, Pa., owns the winning heifer. 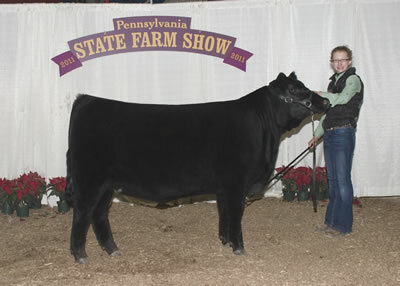 L V A Giddyup Cheyenne 1001 won early junior heifer calf champion at the 2011 Pennsylvania Farm Show's Angus Show, Jan. 10 in Harrisburg, Pa. Alayna Clark, Mifflintown, Pa., owns the winning heifer. 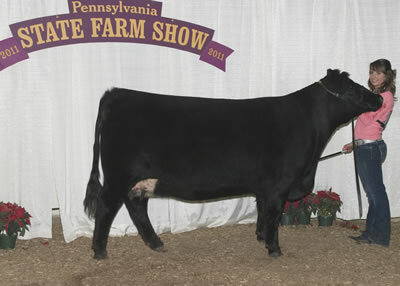 Rains Dreamer Girl PiRL won reserve early junior heifer calf champion at the 2011 Pennsylvania Farm Show's Angus Show, Jan. 10 in Harrisburg, Pa. Dale Rains, Mercer, Pa., owns the winning heifer. 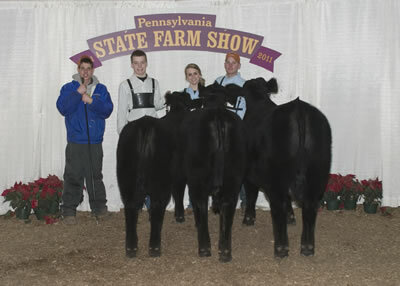 Cherry Knoll Rosebud 030 won late junior heifer calf champion at the 2011 Pennsylvania Farm Show's Angus Show, Jan. 10 in Harrisburg, Pa. Matthew Mitchell, Reinholds, Pa., owns the winning heifer. 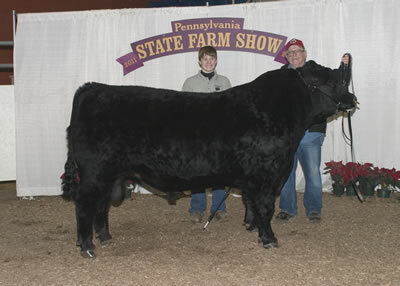 Just Enuff New Edition Edgar won grand champion bull at the 2011 Pennsylvania Farm Show's Angus Show, Jan. 10 in Harrisburg, Pa. Just-Enuff Angus, Bethlehem, Pa., owns the January 2010 son of Duff New Edition 6108. 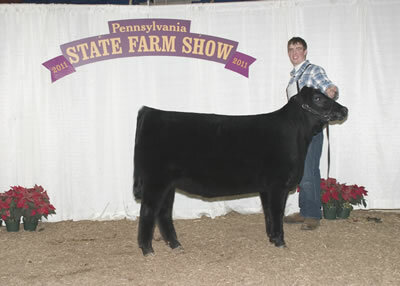 He first won junior calf champion. 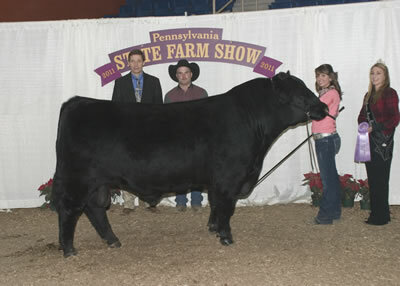 Check Mate won reserve grand champion bull at the 2011 Pennsylvania Farm Show's Angus Show, Jan. 10 in Harrisburg, Pa. Cherry Knoll Farm Inc., West Grove, Pa., and Katrina Frey, Quarryville, Pa., own the September 2008 son of Connealy Danny Boy. He first won senior champion. 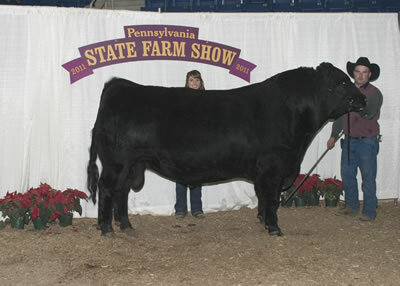 Freys KJF Forward P48 T72 won reserve senior champion bull at the 2011 Pennsylvania Farm Show's Angus Show, Jan. 10 in Harrisburg, Pa. Katrina Frey, Quarryville, Pa., owns the winning bull. 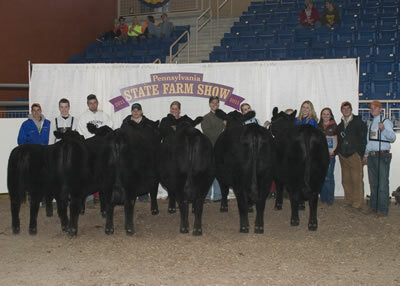 Rains Powerstroke PSNIFPN won junior champion bull at the 2011 Pennsylvania Farm Show's Angus Show, Jan. 10 in Harrisburg, Pa. Dale Rains, Mercer, Pa., owns the winning bull. 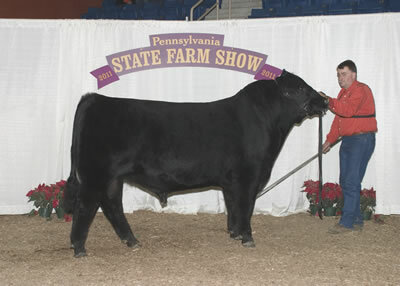 BOO Junior won reserve junior champion bull at the 2011 Pennsylvania Farm Show's Angus Show, Jan. 10 in Harrisburg, Pa. Boones Acre, Hookstown, Pa., owns the winning bull. 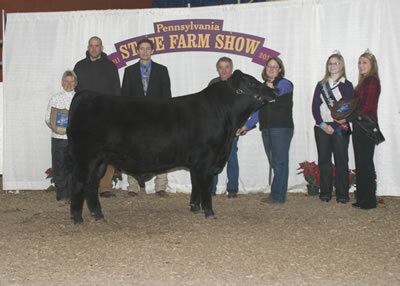 The progeny of S A V Free Spirit 8164 won junior get-of-sire at the 2011 Pennsylvania Farm Show's Angus Show, Jan. 10 in Harrisburg, Pa. Beaver Creek Angus, East Berlin, Pa., owns the winning group. 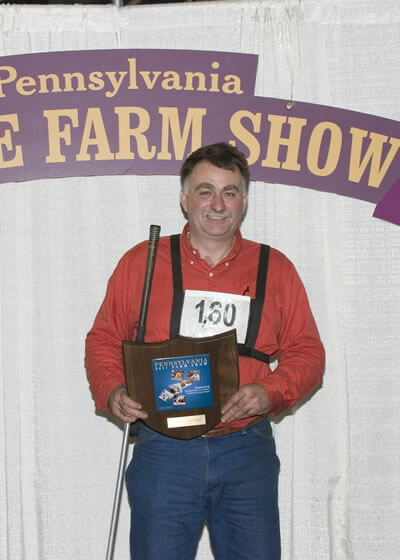 Beaver Creek Angus, East Berlin, Pa., won breeders' best six head at the 2011 Pennsylvania Farm Show's Angus Show, Jan. 10 in Harrisburg, Pa.
Dale Rains, Mercer, Pa., was named premier exhibitor at the 2011 Pennsylvania Farm Show's Angus Show, Jan. 10 in Harrisburg, Pa.